Norway acknowledges the need to accelerate clean energy innovation to respond to our shared climate challenge. What is needed is a massive push for research, development, dissemination and deployment of clean energy technologies, but also cooperation between governments as well as governments and private investors. As a country rich in energy resources and with a history of developing and using innovative energy technologies and solutions Norway is pleased to play a part in Mission Innovation. By 2020, Norway will seek to double the already considerable public resources devoted to developing and demonstrating clean energy technologies and solutions. This means increased efforts on renewable energy technologies, energy efficiency and carbon capture and storage. Important stakeholders will be the Research Council of Norway (RCN) and our two state energy enterprises, Enova and Gassnova, as well as energy research institutions and the private sector. Norway has always given high priority to the development, use and deployment of environmentally sound technologies. Mission Innovation will put the world on a faster route to the point where we can secure energy access for all, while at the same time curbing global emissions of greenhouse gases. 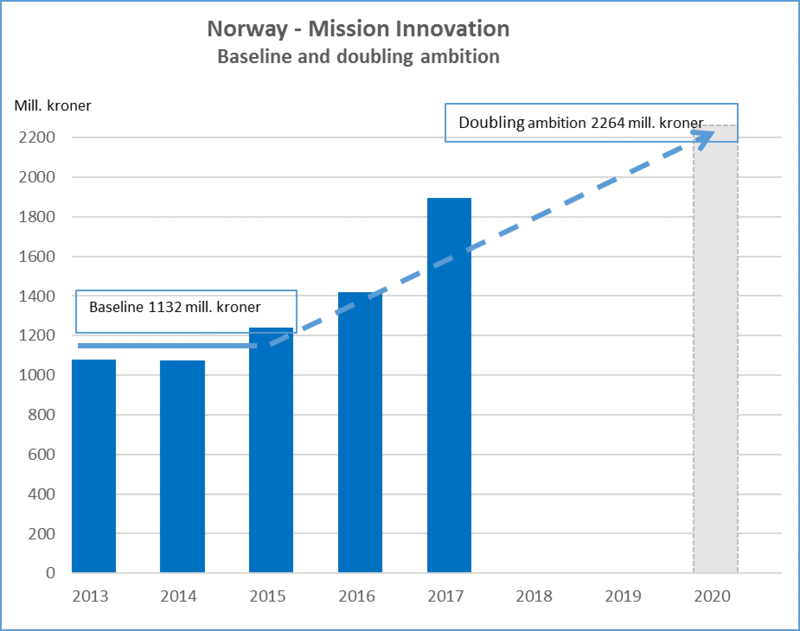 Norway signed the launch statement for Mission Innovation in 2015 because we have a strong commitment to the ambitions in the statement. In the two years since the launch in Paris our dedication to the ambitions in Mission Innovation has grown even stronger. We believe that innovations and technological breakthroughs will be vital to ensure that low carbon energy technologies will be viewed as the best choices when the energy demand grows in many parts of the world. But also in Norway, where we face big challenges concerning replacing old infrastructure and investments in new capacity, innovations and new technology are of great importance. We also believe that investments in the energy sector worldwide will represent some of the most interesting marked opportunities for Norwegian companies, and we want to be part of the global effort to find new and environmentally good solutions. Norway was an active participant when the seven Innovation Challenges were launched in 2016, and have chosen to support all of them. We believe that each topic represents important challenges, and we want to mobilize Norwegian scientists to participate in the international cooperation that strives to find new solutions to these challenges. All three represent areas that have high priority in Norwegian R&D-strategies. Norway therefore wants to follow these challenges closely and contribute in the best way we can. In addition, Norway have taken a big interest in Challenge 6, Clean Energy Materials Innovation Challenge[link to 3.2.6], and plan to participate in the planned activities for this challenge. Energi21 is the Norwegian strategy for research, development and commercialisation of new climate friendly energy technologies. Established in 2008 it focuses on how increased efforts in research and development and new technology can result in enhanced value creation and efficient use of energy resources in the sector. Energi21 sets goals and advises on research and development of technology for renewables, energy efficiency, as well as carbon capture and storage (CCS). Commissioned by the Ministry of Petroleum and Energy (MPE), the strategy has been developed by the industry, research institutions and relevant government bodies. Energi21 aims at contributing to a coordinated, efficient and goal-oriented focus on research and technology, with a strong commitment by the energy sector at its centre. In these areas Norway enjoys competitive advantages, thanks to its natural energy resources, a strong technology and knowledge base and industry experience. ENERGIX: The ENERGIX programme provides funding for research on renewable energy, efficient use of energy, energy systems and energy policy. This encompasses both natural science and engineering as well as social science-based research and development. ENERGIX has a wide range of funding instruments, and both industry, research institutes and universities can apply for funding. The programme is a key instrument in the implementation of Norway’s national RD&D strategy, Energi21, as well as for achieving other energy policy objectives. Centres for Environmentally-Friendly Energy Research: The scheme of the Centres for Environment-friendly Energy Research (FME) seeks to develop expertise and promote innovation through long-term research in selected areas of environment-friendly energy. There are today 11 FME centres within renewable energy, energy efficiency, social sciences and CO2 management. The centres are hosted by either research institute or universities. The research activity is carried out in close cooperation between prominent research communities and industry partners. Enova: Enova is a state-owned enterprise owned by the Norwegian Ministry of Petroleum and Energy. Enova’s objective is to promote a shift to more environmentally friendly consumption and production, as well as development of energy and climate technology. Enova’s tasks are set out in a four- year agreement between the Ministry of Petroleum and Energy and Enova. With regard to technology, the agreement requires that work on energy and climate technology must result in a reduction of greenhouse gas emissions and promote a long-term shift in energy consumption and production through the development and market introduction of new technologies and new solutions. Enova must focus its efforts on the development of new technology and support for technologies and solutions close to market introduction. CLIMIT (RCN/Gassnova): The CLIMIT Programme is Norway’s national programme for research, development and demonstration of CO2 capture and storage technology (CCS). The programme is directed towards companies, research institutes and academia. Collaboration with international partners is encouraged. The programme consists of two support schemes; CLIMIT R&D and CLIMIT-Demo, run by the Research Council of Norway and Gassnova respectively. CLIMIT aims for a balanced project portfolio and supports technology projects spanning from basic research to demonstration in the final stage before commercial launch. CO2 Capture and Storage Large-scale Demonstration: The Norwegian government’s strategy for CCS, presented in October 2014, spans across a broad range of measures including research, development and demonstration, realising a full-scale CCS-facility, transport, storage and alternative use of CO2 and international cooperation for promoting CCS. A continued, strong support of CLIMIT, Centres for Environmentally-friendly Energy Research (FME) and international research activities is an important part of the strategy, c.f. above. Technology Centre Mongstad (TCM): TCM is a world-class test-facility that bridges a gap in the technology chain by enabling testing, verification and demonstration of CO2 capture technologies on an industrial scale. The main objective of the centre is to support test campaigns and identify actions leading to reduced costs and technical, environmental and financial risks associated with implementing CO2 capture technologies in full scale. The facility has been in operation since 2012, and has completed a large number of test campaigns for different vendors. Large-scale CCS Demonstration Facility: The government’s ambition is to realise at least one full-scale demonstration facility for CCS by 2022. Realising such a facility in Norway is challenging as there are few large, suitable emissions sources. The government has since 2014 conducted studies on potential full scale projects in Norway. In the spring of 2017 three industry players were awarded financial support to conduct further concept studies. Before a final investment decision, a FEED-phase will also be needed. We are well on track to achieve our ambition. In the field of energy R&D, international cooperation is given high priority in Norway and it is an important supplement to national research efforts. Participation in international projects provides opportunities for building up professional expertise and gives scientific and financial support in solving important research tasks. International cooperation also provides a showcase for Norwegian technology and know-how suppliers. In the energy field, Norway is primarily involved in cooperation under the EU system, the International Energy Agency (IEA) and at Nordic level. Norway is also involved in a number of bilateral (the US, Japan) and multilateral (CSLF, IPHE) agreements. The baseline is composed of relevant budgetary allocations for the fiscal years of 2013-2015, as defined by the Norwegian definition of clean energy RD&D, of the Ministry of Petroleum and Energy. Other Ministries may also have relevant budgetary allocations. These are not included in the MI baseline, nor will they be counted in as part of the target funding amount in 2020. The state budget is decided by the Norwegian parliament annually. Research, development and demonstration in environmentally friendly technologies, including end-use energy efficiency, renewable energy, electric grid technologies, CO2 capture and storage and low-carbon transportation systems and fuels. The Norwegian government have increased R&D-budgets for environmentally friendly energy solutions with more than 60 percent from the baseline-level. This means that Norway is well on track to fulfil the doubling ambition. One important reason for this is the strong support for technology within Carbon Capture and Storage – CCS, with the goal of realizing at least one full-scale demonstration project for carbon capture and storage by 2022. But also the regular budgets for energy R&DD have been increased by more than 60 per cent.